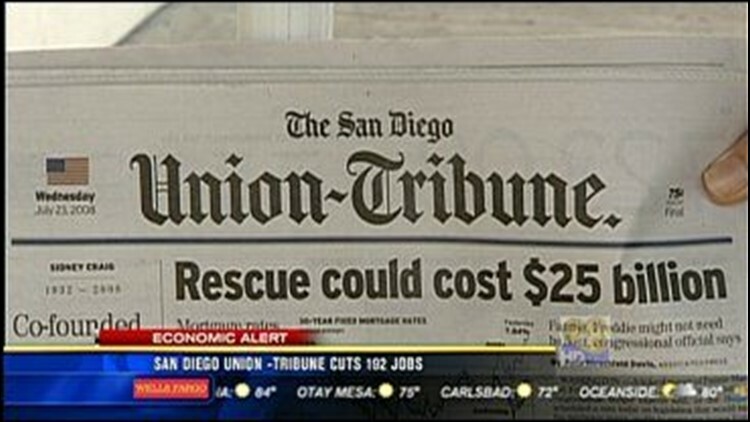 SAN DIEGO (AP) - The San Diego Union-Tribune is cutting 192 jobs in another round of layoffs affecting all departments at the newspaper. The Union-Tribune said Thursday the layoffs amount to about 18 percent of its staff, which will be reduced to about 850 after the cuts become effective July 6. The layoffs come three days after Platinum Equity, a Beverly Hills private equity firm, completed its acquisition of the newspaper from Copley Press Inc. The newspaper did not disclose the number of cuts in each department, including in the newsroom.